Mortgage markets improved this week as positive economic data was overshadowed by geopolitical strife. A flight-to-quality drove buy-side activity in mortgage bond markets, which, in turn, helped conforming rates fall across the state of California. The second is tied to jobs. 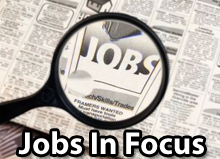 Last month’s jobs data was weaker-than-expected on Wall Street and it sparked a mini-rally in mortgage rates to start the year. Jobs are paramount to economic recovery so if this month’s figures are lower than the consensus figure of 150,000, expect mortgage rates in Coto de Caza to fall. If the number is stronger than 150,000, expect mortgage rates to rise. Last month’s reading is an 8-month high for New Home Sales, and the latest in a series of signals that housing is improving in Coto de Caza and around the country. Luxury homes accounted for less than 5% of the newly-built home market, suggesting that California homeowners are either not “buying new” as frequently, or are choosing to renovate their existing properties instead. And finally, of particular interest to South Orange County home buyers and mortgage rate shoppers, for the second straight month, the Federal Open Market Committee’s statement contained an entire paragraph detailing the Federal Reserve’s dual mandate of managing inflation levels, while fostering maximum employment. Mortgage market reaction to the FOMC has been positive since the statement’s release. Mortgage rates in Coto de Caza are unchanged, but poised to improve. Home values were reported unchanged in November 2010, on average, according to the Federal Home Finance Agency’s Home Price Index. We say “on average” because the government’s Home Price Index is a data composite for the country. The index doesn’t measure citywide changes in places like Trabuco Canyon , nor does it get granular down to the neighborhood level to measure places like Orange County. Instead, the Home Price Index groups state data in 9 regions with each regions having as few as 4 states in it, and as many as 8. 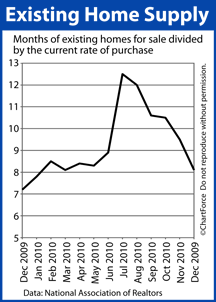 Not surprisingly, each of the regions posted different price change figures for the period of October-to-November 2010. The complete regional list is available at the FHFA website. That said, none of these numbers are particularly helpful to today’s home buyers and sellers and that’s because everyday people don’t buy and sell homes on the Regional Level. We do it locally and the government’s Home Price Index can’t capture data at that level. It’s a similar reason to why the Case-Shiller Index is irrelevant to buyers and sellers. November’s Case-Shiller Index showed home values down 1 percent in November, but that conclusion is a composite of just 20 cities nationwide — and they’re not even the 20 largest cities. Philadelphia, Houston and San Jose are conspicuously absent from the Case-Shiller list. So why are reports like the Home Price and the Case-Shiller Index even published at all? Because, as national indicators, they help governments make policy, businesses make decisions, and banks make guidelines. Entities like that are national and require data that describe the economy as a whole. Home buyers and sellers, by contrast, need it locally. 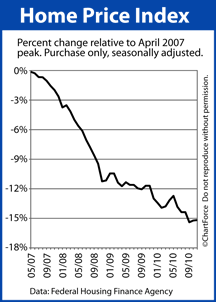 Since peaking in April 2007, the Home Price Index is off 14.9 percent. The Fed Meets Today. What It Means To Mortgage Rates. The Federal Open Market Committee begins a 2-day meeting today in Washington D.C. It’s the group’s first meeting of 2011 — one of 8 scheduled for the year. The Fed meets every 45 days, on average. Its last meeting was December 14, 2010. Rate shoppers and home buyers should make a note. 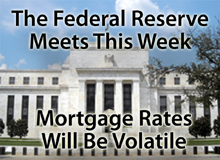 Mortgage rates and home affordability could change dramatically beginning tomorrow afternoon. 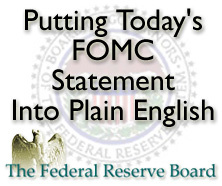 Because Wall Street watches FOMC meetings closely, so should you. The meetings provide insight on the future of U.S. monetary policy, as told by the nation’s central banker. Investors make trades based on the FOMC’s commentary which is one reason why mortgage rates tend to undulate through the hours leading up to the FOMC’s adjournment, and the days immediately after. Wall Street is shifting old bets, and placing new ones. A terrific example of this is what happened after the Fed’s November 3, 2010 meeting. In its post-meeting press release, the Federal Reserve announced a new, $600 billion, market-bolstering plan dubbed “QE2”. Wall Street had widely expected the Fed to create the program, but had underestimated its size. Starting a $600 billion program sparked fears of a Fed-led inflation run, which, in turn, caused mortgage markets to deteriorate in a hurry. In the 3 days following the program’s announcement, mortgage rates spiked to multi-month highs and have not since recovered. QE2 marked the beginning of the end of the Refi Boom and low rates. 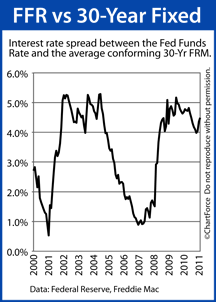 Today, conforming rates in California are relatively low as compared to higher, but are much higher than they were prior to the FOMC’s November 2010 meeting. Then, December’s FOMC meeting did little to change the direction of rates. We shouldn’t expect that January’s will, either. After the FOMC’s 2:15 PM ET adjournment Wednesday, mortgage rates should resume climbing, as they have done for the past 10 weeks. If you’re shopping for a mortgage rate, therefore, the prudent move is to lock prior to Wednesday’s FOMC adjournment because, after once the Fed’s outlook is released, it will be too late. Comments Off on The Fed Meets Today. What It Means To Mortgage Rates. As the body of U.S. economic data continues to show slow, steady improvement, Wall Street is becoming a net-seller of mortgage-backed bonds. 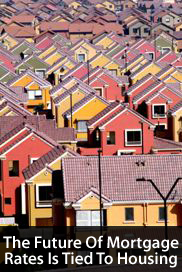 As a result, conforming mortgages rates in California are rising. This is why conforming and FHA mortgage rates rose last week in California. Existing home supplies plunged to a 2-year low in December, and unemployment claims dropped more than expected, giving hope for the U.S. economy in 2011. Since November 3, mortgage rates have been trending higher in Trabuco Canyon and across the country. The Refi Boom is over, but low rates remain — for now. If you’ve yet to lock a mortgage rate, consider doing it soon. So, take note, Coto de Caza home buyers. This spring, along with mortgage rates, home values should rise, too. 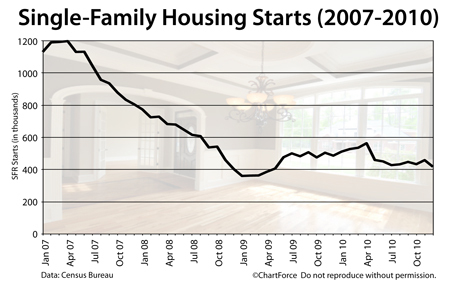 Expect less “bang for your buck” as the housing recovery takes hold here in South Orange County and across the nation. Each month, in conjunction with the Department of Housing and Urban Development, the Census Bureau releases its New Residential Construction report. The report is comprised of several sections, one of which counts the number of homes that have “broken ground” in California and nationwide. 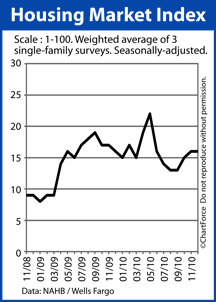 According to the NAHB, the market for newly-built, single family homes remains relatively weak “following a below-expectations finish in 2010”. Builders expect a better 2011. 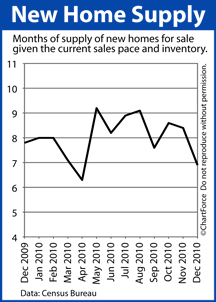 In January, market conditions for current and future sales were deemed to be flat. Foot traffic is seen as increasing. For homebuyers of new homes in Trabuco Canyon , this data may foretell of more bidding wars in the months ahead. Conforming and FHA mortgages in California increased in rate by roughly 1/8 percent.